Jen Glaser’s presentation to our teachers on Monday evening reminded me of an interesting article I read on Teachthought recently. In 2010 Peter Pappas developed A Taxonomy of Reflection: Critical Thinking For Students, Teachers, and Principals. 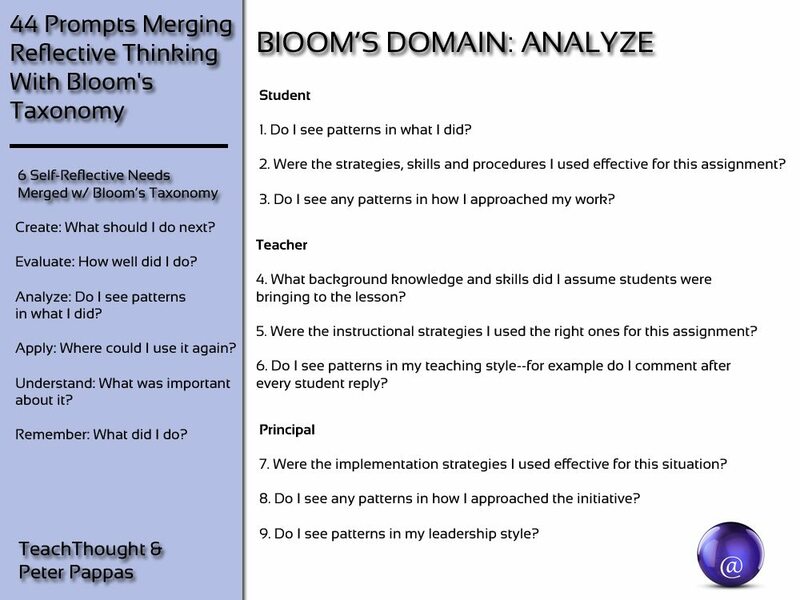 In this recent TeachThought article he shares 44 Prompts Merging Reflective Thinking With Bloom’s Taxonomy. I developed my Taxonomy of Reflection in an effort to provide a schema of prompts that could be used by students, teachers and administrators to hone their reflective skills. I used Bloom’s well-known Taxonomy of Thinking Skills since I think that self reflection has similar “levels.” Consider the stereotypical student response to a parent’s query “What did you do in school today?” The most many parents hope for is an accurate report on what happened. Seen through Bloom, that’s the equivalent of “Remembering: Retrieving, recognizing, and recalling relevant knowledge from short- or long-term memory.” My goal was to develop a system of prompts that would raise students to higher levels of reflection that corresponded with Bloom’s analysis, evaluation and creation. As I worked on the student prompts, I realized that the same approach could be used to generate valuable reflective prompts for teachers and administrators. I particularly like the way he has applied this approach to reflection by students, teachers and principals (or anyone in a leadership role); reflection should be part of everything we do. This illustration shows the macro prompts (broad questions) one for of Bloom’s domains, and a sample of the more specific questions, for students, teachers and principals/leaders for the Analyse domain. If you follow the link to the full article you will find the rest of the 44 prompts plus links to further information for reflective thinking for students, teachers and principals. I think the questions mostly fit in the “procedural” or “collaborative” quadrants, as described by Jen but you could easily use Bloom’s domains when thinking about questions for discipline and inquiry – what do you think?